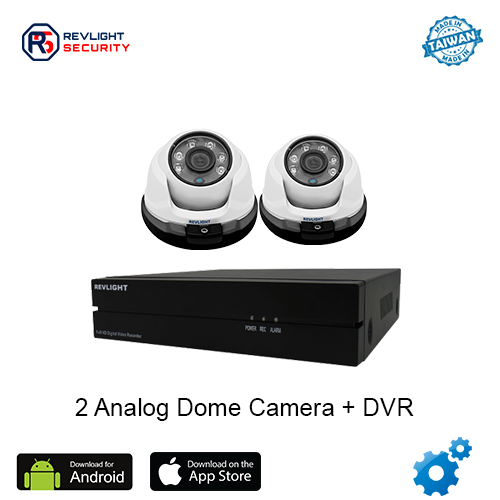 Our 2 Camera DVR Security System Consists of 2 analog camera including one 4 channel dvr system with 1 TB video recording storage, which has 1 year warranty. With a 2 Camera DVR Security System, Peace Of Mind Just Got More Affordable. When protecting your home or office from theft or trespass, you just want something that works and is easy to use while being one of the best HD CCTV Security cameras available. A 2 camera DVR security system does just that. This Analog Camera is so small, and highly effective, this camera delivers HD video of 1080 resolution, this analog camera is weather proof and can be used both indoor and outdoor. This Analog camera comes with an adjustable bracket and is both ceiling and wall mountable. 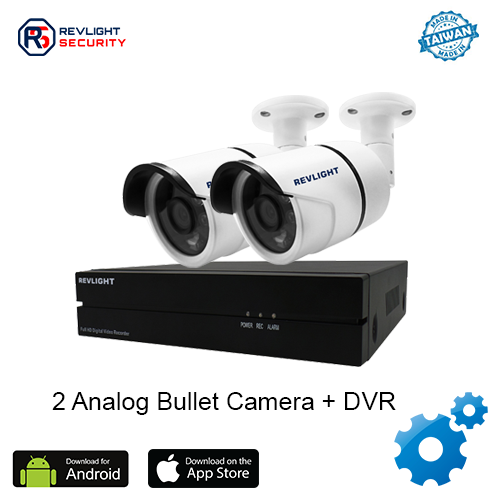 The Revlight Security Company is providing you the Best HD CCTV Security Camera System with High Quality resolution. All of our analog cameras are reliable, easy to install compatible with all standard power/video BNC (round) connectors. When paired with our Digital Video Recorder (DVR) you can watch from anywhere at anytime. Reviewing past videos is also simple with our easy to use DVR viewer apps on any smart phone, tablet or PC. .
How to Contact Revlight Security Team ? Every home and business are unique, and 2 camera surveillance system with DVR can be adapted to fit your needs. Not sure what’s best for you? Just talk to our experts! Call our Revlight Security CCTV Team experts today for a free consultation at +65 6678-6557. Try a Professional grade 2 surveillance security system now!